The cold drives things everywhere, like skiers to mountaintops and geese south for the winter, and yet somehow it's always gotta "cover somebody's shift" every single time you need a lift to the airport. For a longstanding Mexican joint getting driven here by it, check out Mr. Taco. Run by three bros who started the business in Mexico City, flourished in Chicago for 30 years, and finally got their butts to Miami "because of the weather", walkable-from-the-beach Mr. T puts out the family's traditional Mexican fare in a space done up in festive blue & red, with a brick bar and on the wall, a single poncho, not to be confused with a single Ponch, which with that hair, is like, impossible. 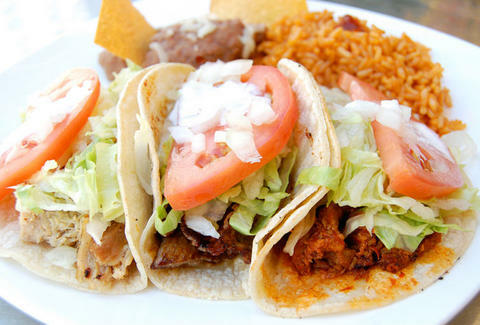 Crispy or soft tacos (topped with lettuce, tomato, and crema) get jammed with meats like seven-hour-simmered lengua (cow tongue); al pastor (shredded beef and pork blend in a red pepper spice mix); guajillo-cooked chunked pork; and shredded chicken, aka Perdue Ferrigno. Beyond tacos there's a bunch of stuff that uses the same meats, such as quesadillas, tortas, massive sincronizadas (open burritos layered with beans, guac, sour cream, meat, and cheese capped w/ another tortilla, then crisped on the griddle), and huge burritos with fried beans, guac, and mozz/Chihuahua cheese, which quieros itself! Mr. T also crafts burgers topped with pretty much any of the ingredients in their other dishes, and they also do a mean agua de horchata, a milky Mexican drink concocted from ground almonds, sesame seeds, rice, barley, and tubers known as "tigernuts" -- also what you'd have to be to let that dude drive you anywhere.